wow, yeah, I’d also say there is a big problem with traffic in Beijing. ohhlalala:)) looks like an ant colony from top view! It is not in Beijing. There are no road so wide here, it is seemed to be in US somewhere. Holy Moses!! This can’t be real, can it?? I counted. There’re 10 lanes in each direction. I’ve heard of how bad the traffic jams are in BJ, but I didn’t realize it can be so horrific. I thought Shanghai’s traffic is bad enough, but BJ definitely dwarfs SH in this respect. It seems it is NOT Beijing. Sorry for the confusion. this picture is not beijing, but america. This looks like a PS work. Don’t think there is a freeway with 10 lanes in US… or anywhere else. it is fake, check duplicates on image. Fake… people please look closely at all the duplicate white cars/trucks! When I-10 west out of Houston it will be 10 lanes each way. The advance in technology does not mean improvement in the way of life. This scene is definitely a man made problem. An artificial problem! that is the 605 freeway in L. A. going from the valley to Los Angeles. Photo clearly has been altered (Photoshop or other). A close look of the traffic in the right lanes shows that the 5 lanes have been doubled to 10. For example, there is what appears to be a two-tone pickup truck in the far left lane, opposite a large white truck on the inside lane coming the opposite direction. The same pickup truck can be seen 5 lanes to the right. Right in the center of the photo there are 3 larger white vehicles heading away from the photographer in the 4th lane from the left. Identical vehicles are found 5 lanes to the right. Clearly fake photo. 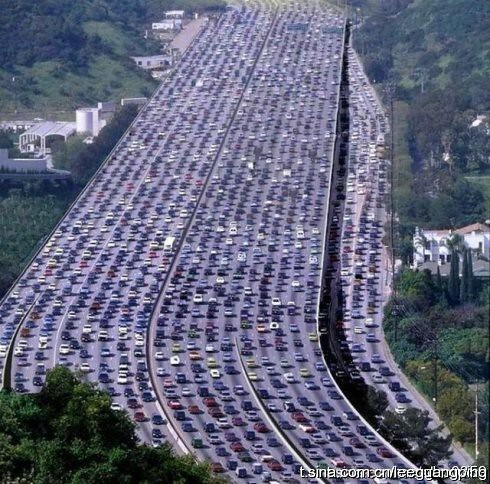 This picture may be fake, but the traffic in Beijing is real. it looks like the area next to the Getty Center on the 405 freeway. the two tunnel looking things on the left and the ramp leading away from it looks like the tram system that they have. and its definitely been photoshopped. not just the duplicate cars, but if you look at the top, there seems to be two of the (same) road signs… and it’d be a terrible idea to have a giant pole in the middle of the lanes… just sayin. Huge colony of small ants creeping on the road, it much worse than Jakarta……!!!!! :))) I think this is not road, it is a parking area, what do you think?